Even within a season as unadored as the sixteenth, the grand finale is one marked out by an abject lack of appreciation. Most stories have their champions, even in the Williams era, but The Armageddon Factor's are few and far between. The previous outing, the much-derided The Power of Kroll gets more love – significantly more love – due to its glorious B-movie campness. Kroll be praised. Yet I come here to defend The Armageddon Factor and lend my support to its worthy cause. For me, it’s no more than a marginal notch down on the first four (classics) of the Key to Time season, and that's mainly because it rather fumbles the touchdown. It’s that rare six-parter justifying its length with plot to spare – making it mystifying that it gets labelled dull or boring – and a set-bound story managing to pass off three convincingly-rendered worlds. And it has Drax. Is Drax the ultimate Marmite Williams-era character? My approach to Season 16 has been, pretty much, that you either like the Williams style or you don't, embodying as it does most fully the period's best qualities (Season 17 has greater peaks, perhaps, but is generally patchier). That could also be applied to the cockney Time Lord (I don't mean Tennant). While he's only in the final third of the story, I think it's probably fair to suggest that if you don't like Drax, you probably don't like The Armageddon Factor. He is, after all, very colourful. Very demotic. But he's also merely one element in a story brimming with them (one the Bristol Boys lifted from their initial draft of The Hand of Fear, when it was still a six-parter). And in fairness, a few have recognised this abundance of ideas over the years; they're just in the minority to those who scorn the season finale. Craig Hinton, in DWB 83, noted it "was packed to the rafters with ideas. And little coherence. I am very fond of space opera and am very fond of The Armageddon Factor. But I dare anyone to watch it once and then try to explain it! Mysterious figures from the Doctor's past, insane military despots, deformed supervillains, love affairs, royal dynasties, supercomputers, time loops, mind control… The story was too busy, even for a six-parter". And Alan Barnes, in his DWM 290 piece on the season, waxing lyrical about its appeal to the nine-year old imagination while suggesting there’s nothing going on under the hood, vouched for these same ideas: "… the Marshal rubbing his neck and talking into a two-way mirror with a skull behind it; the Doctor rescuing K9 from an Atrian furnace; Drax; Drax miniaturising the Doctor; the incredibly shrunk Drax and the Doctor travelling about inside K9; and the invention of the Randomiser, the season’s coup de grace" While I diverge with his take in one significant area, he's right that the story just doesn't ignite enthusiasm for many, and I don't really know why (aside from the complaint that it's dull and boring): "But, strangely, no one ever talks about many of these bits; no one mentions, for example, the Doctor being bamboozled by five illusory Romanas in The Armageddon Factor, the second most exciting thing about Part Twenty-Five (after K9 becoming evil, Obviously)". Some takes have grudgingly conceded ground and acknowledged that The Armageddon Factor isn’t actually that bad, perhaps most surprisingly About Time (in that the review isn't a prosecution/ defence, as was the Tat Wood/ Lawrence Miles standard by this point, but just the one, so I have to assume Miles didn't despise it), observing "it’s nowhere near as catastrophic as expected" and that "both the design and direction are freakishly coherent" for the period. This merits further recognition, as, in contrast to The Discontinuity Guide's assertion that it's "a dreary end-of-season Oh-my-God-the-money's-run-out 'spectacular' " Michael Hayes makes his worlds distinctive and atmospheric. The Armageddon Factor goes against the prevailing view of shoddily-constructed sets and unsympathetic lighting usually (and sometimes not unfairly) levelled at the era, and while no one would mistake Hayes for Graeme Harper, he clearly knows how to use the camera to best tell the story. 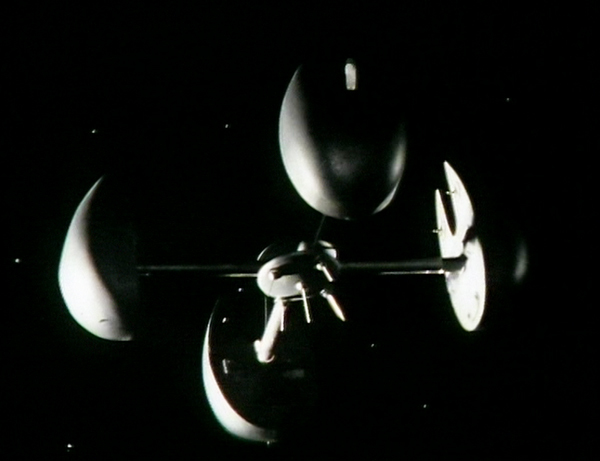 Atrios is convincingly crumbling, but through design rather than the tacky sets falling apart, and its costumes, planetary crest and control room are designs (from Richard McManan Smith and Michael Burdle) up there with the best of the Hinchcliffe era. 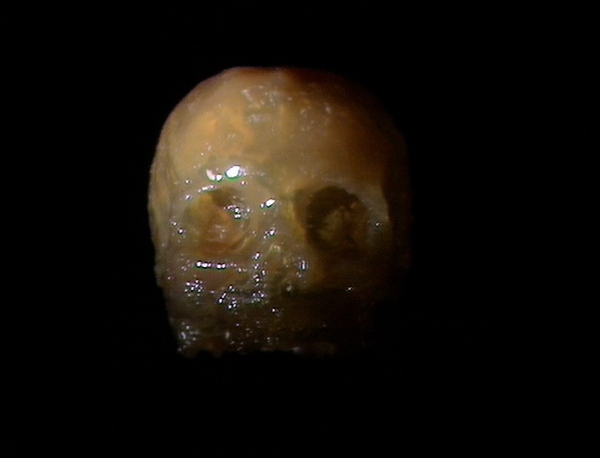 Mentalis makes for a simple yet effectively-visualised super computer, while the Shadow may be the epitome (or nadir, have it as you will) of the BWAHAHAHAHAvillain (I'd defend him as great value for that very reason), but few would deny the effectiveness of his skull-like makeup. Hero: Kiss the children for me. Tell them their daddy will return before long. The Discontinuity Guide also levels the charge that "There’s a parody of bad television and propaganda in the first scene… However, this would only work if the rest of 'The Armageddon Factor' were lavish and believable and populated by actors working at the height of their powers" but I'd disagree. Like much of this season – to Elizabeth Sandifer's vexation – The Armageddon Factor treads the fine line between active parody and straight-faced seriousness that makes the insert entirely of a piece. 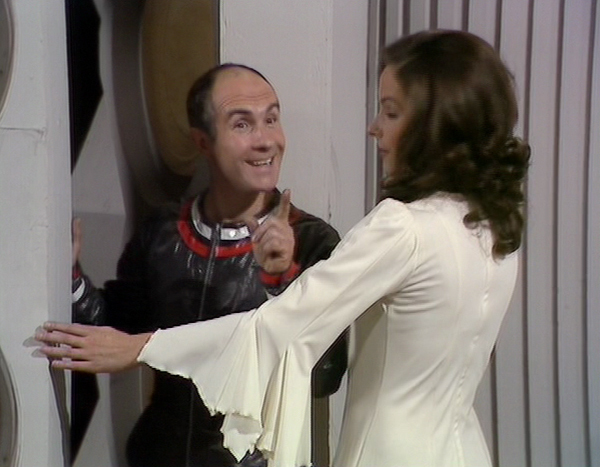 You could practically swap Ian Liston's hero in that clip for Ian Seynor's Merak and no one would be any the wiser… except that Merak is widely recognised by everyone he meets to be a bit of a drip (as noted in The Television Companion, he "seems to spend the entire story wandering around calling for Astra"), even by a character possibly even more divisive than Drax: Shapp. The Doctor: Have you ever seen a Zeon, Shapp? Shapp: Not since the war started. 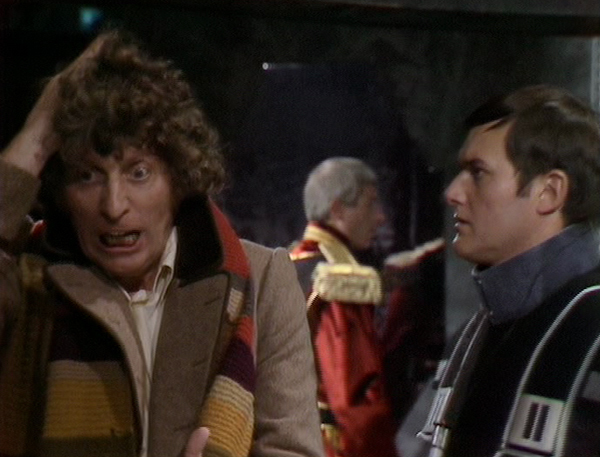 The Doctor: No, but before the war? Shapp: Well, of course. We traded with them. The Doctor: What do they look like? Shapp: Er, much the same as us. Their clothes are different, but apart from that. 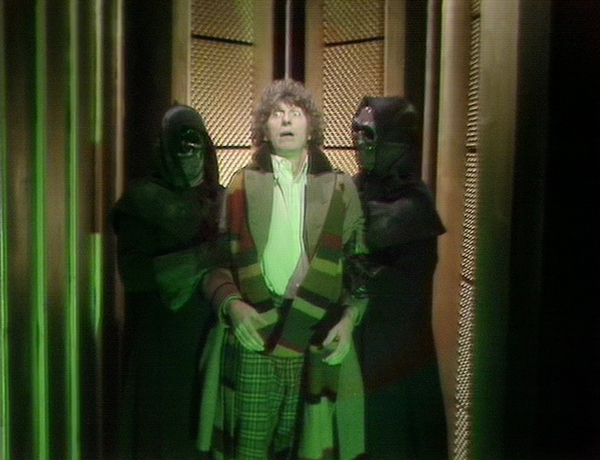 The Doctor: They're not tall, emaciated creatures in long black robes? 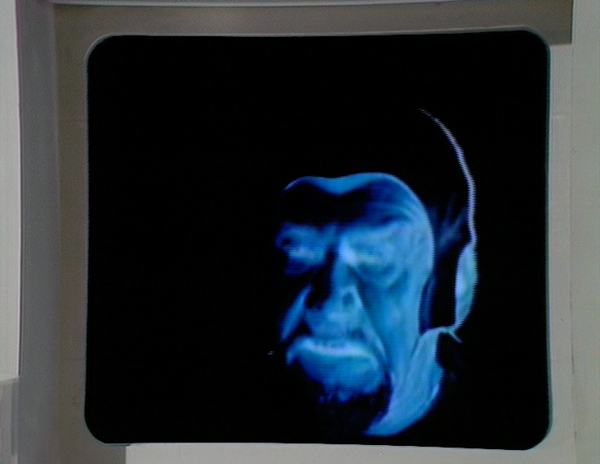 The Doctor: You, Shapp, are to contact the Marshal. Tell him he's won. Tell him the war's over. Tell him anything you like, but stop him taking any further action. Shapp: And if I can't? Shapp: If the Marshal refuses to listen? Shapp: If he insists on going ahead? 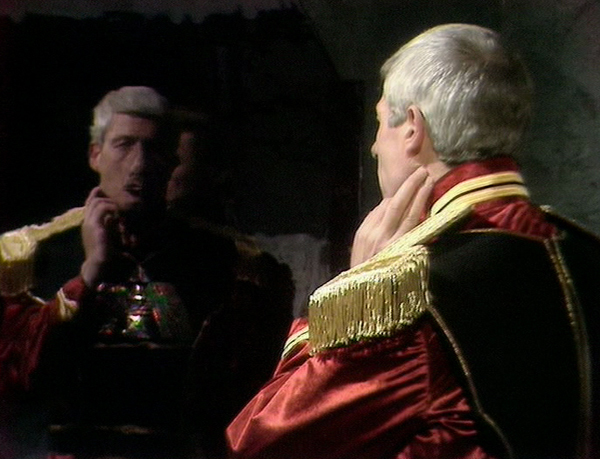 The Doctor: Well, then Mentalis will go into its Armageddon sequence, we'll be bits of dust flying round the cosmos, including the Marshal. You might even tell him that. It takes some doing to dictate the rhythm of a scene to Tom, but both Harries and Barry Jackson manage it in their exchanges. Perhaps the only surprise is that Sandifer didn't have the knives out as much as she might have done ("the production is solid enough to elevate the script" and has "a decent bit of swagger"), although she’s obviously annoyed that the conclusion didn't fit her idea of what she wanted the season to be ("the anti-epic") and manages to get herself into an untenable position by worshipping everything Adams does yet despising everything belonging to the Bristol Boys. She remains stuck on the idea that this era might be distasteful – "It's never quite clear whether the show is engaged in good-natured satire that's aware of its own technical limitations or whether it's just given up on the idea that it can possibly be good and is just being bitter about it" – rather than tackling whether it's funny or not, accusing "the back half being characterised by egregious conceptual laziness" while simultaneously admitting that Baker and Martin "do get a few clever ideas in" such as the fake segment and the "compelling and clever" stretching time loop (these presumably being examples of the egregious conceptual laziness in the back half of the story). 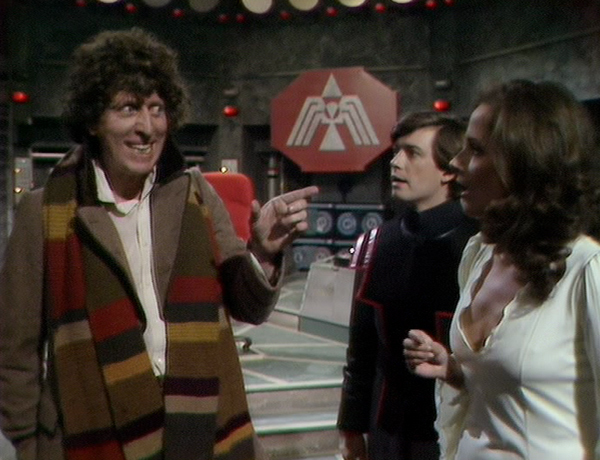 Romana: Yes, we've got him exactly where he wants us. Sandifer loathes the Bristol Boys:"They think they’re writing Star Wars for the BBC". They do? If so, they must have been under this illusion from The Mutants onwards, five years prior to start of George Lucas' saga. Really, she’s pissed at their "grandiose epic-by-numbers", based on her flawed theory that the whole was set up by Bob Holmes as an attempt to demolish the fundamentals of the epic. She bemoans the ludicrous clichés they include but ignores how many wonderfully odd elements there are (mostly the ones Barnes singles out), fixated on how "All notions of balance are just out the window…" and it becomes about straightforward good and bad guys and "more appallingly, Drax". And there you have it. Sandifer doesn't like Drax. Case closed. 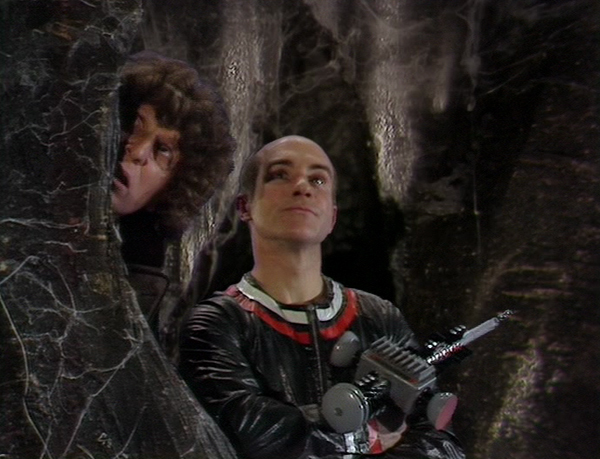 Barnes makes a good point in the second DWM Fourth Doctor Special that the Hinchcliffe era was steadily moving "towards bigger and sillier characterisations, there to ensure the leading man wasn't going to completely dominate the screen, there to give him a hint of competition". It's why you get the accusation levelled at the subsequent period that everyone was encouraged to go OTT too frequently, with even poor Williams pleading guilty (once such commonly-argued example being Bruce Purchase). I'm of the view that the comic turns of this era rarely go wrong; I'll even support Lewis Fiander(!) You'll find just as fine performances from actors choosing to be deadpan or witty, rather than broad. In all Hayes' productions, actually. Jeffries is great, Glover is magnificent, and John Woodvine's Marshal is note perfect in his pompous self-delusion, be it being prompted to quote Richard II ("This blessed plot!") or his poetic Strangelovian delirium over the apocalyptic destruction he’s about to unleash ("Beautiful mushrooms will blossom and burst"). Barnes points out that, as the Marshal is eased out, Drax is introduced to take up the slack; as such, there's no slack here. 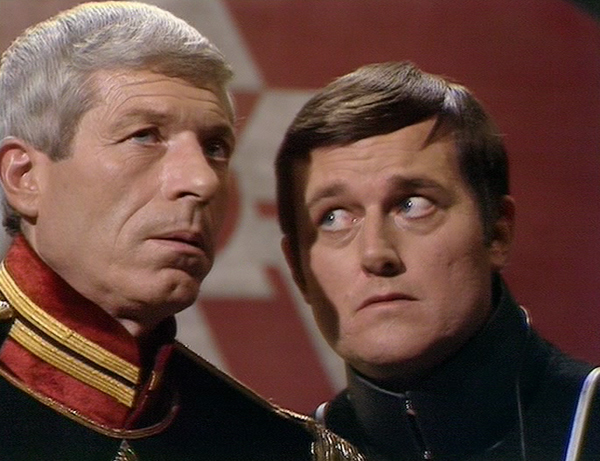 As the a villain of the second order, meanwhile, William Squire knows the Shadow is made of cardboard, and so plays him as such. Is he remotely plausible? No. 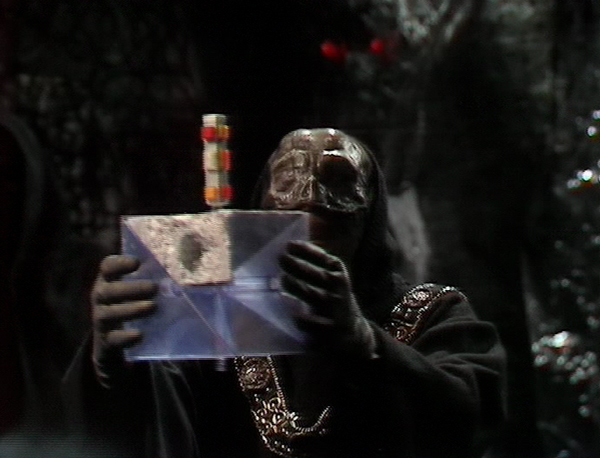 Particularly when he lets the Doctor go (Episode 3), deceived by his own over-confidence, or takes an inordinate amount of time (Episode 6) to take the assembled Key, so allowing it be snatched from under him. My only regret is that we never get to witness him putting the heavy on Drax; the interaction would surely have been comedy gold. I’ve mentioned Shapp and Merak (the insipid hero isn't uncommon in any era, and earlier this season we had Adams offering variants with Kimus and Pralix), but we should also note Princess Astra, more interesting conceptually than for anything Ward brings to the role (not that she isn't forgettably fine). 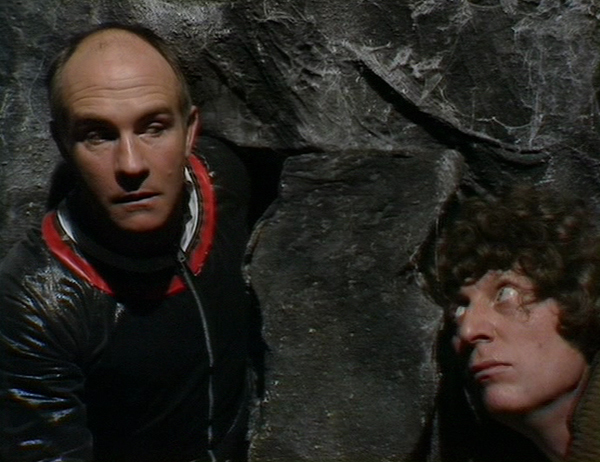 Baker and Martin, ever full of ideas, originally intended the Shadow's Shadow to be the sixth segment (just how would that have played out? No doubt with a mile-long streak of egregious conceptual laziness), Astra’s embodiment coming at Anthony Read's instigation (as did Mentalis and Zeos – in his own way, Read is every bit as instrumental to the rigour of Season 16 as Bidmead is to 18, and it's notable that it falls apart when he isn't there any longer: in the final scene). 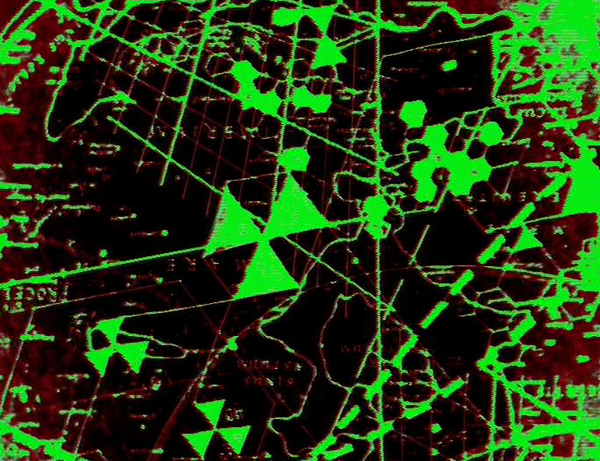 There are indeed numerous questionable logic holes in The Armageddon Factor, but one does have to assume, unless a prevailing intelligence is guiding the disassembly, that if Astra resumes her previous form, so do all the other segments. 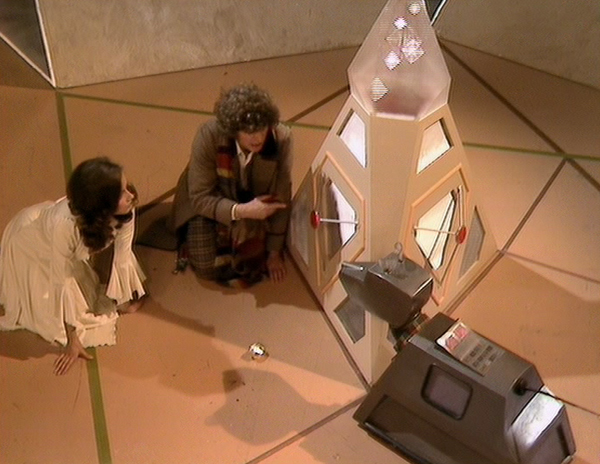 This is also the last we’ll see/hear of Romana and K9 in their current forms (at least until Season 18 for Leeson). As an unashamed K9 enthusiast, I'd make the case this might be his finest heroic hour, courtesy of his creators, appropriately. Where JN-T (and Bidmead) straight up didn't like the dog, Baker and Martin know that putting him in danger will leave the audience worried and on side, hence the dedicated episode 2 cliffhanger. His interaction with Drax is a joy, his self-assuredness on finding someone on his level to chinwag with (Mentalis) amusing, and his dreadful attempt at lying to the Shadow (lucky he’s such an ijit) downright hilarious. And he gets to be a Trojan Dog. Merak: Where is she? Where's Astra? The Doctor: Just a minute, just a minute. Why do you want to know? 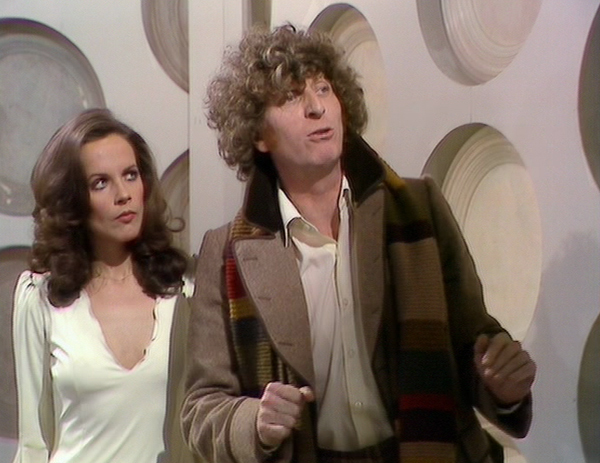 As for Tamm, aside from wearing her most flattering outfit, she's completely synchronised with Tom by this point. 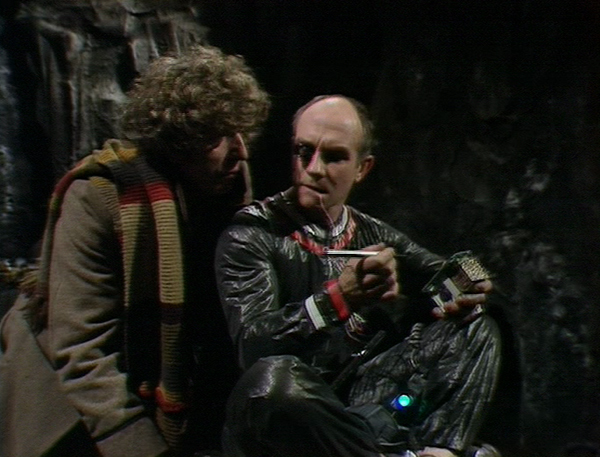 I may be in the minority, but I find their dynamic far more effective than the subsequent regeneration, which has its highs (City of Death) but equally its lows (Season 18). 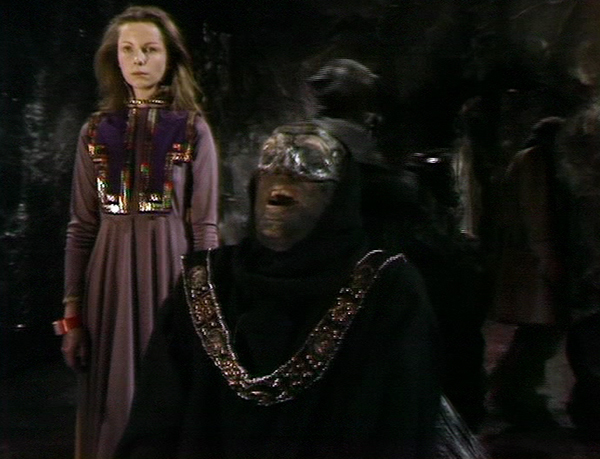 This might not be Romana I's most enjoyable showing overall, not having been conceived as a send-off, let alone a grand one, but she's allowed to deliver outrage (Astra's fate at the indifferent hands of the Guardians), show she can handle herself (overpowering Merak; okay, anyone could, but still) and share comic asides with the Doctor in response to Merak's peerless wetness (above). 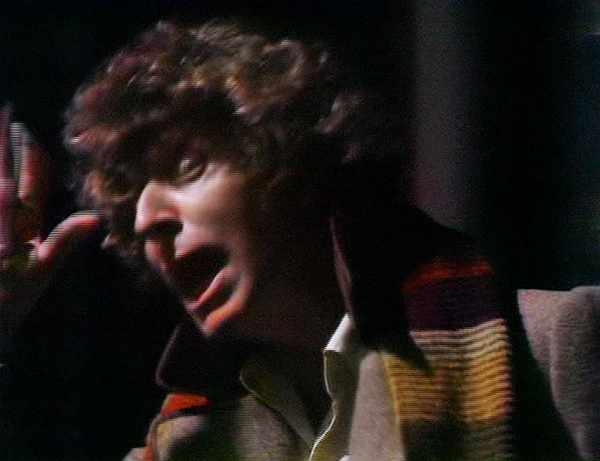 The Doctor: Listen, we tell you the truth and you don't believe us. You accuse us of crimes we haven't committed, and now you're going to have us shot. I think after a long journey that's a bit too much, Marshal. K9, lights! 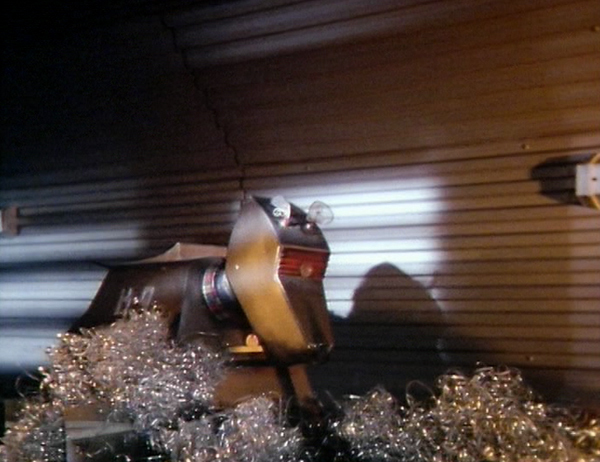 (K9 kills the lights.) Goodbye, Marshal. Come on. 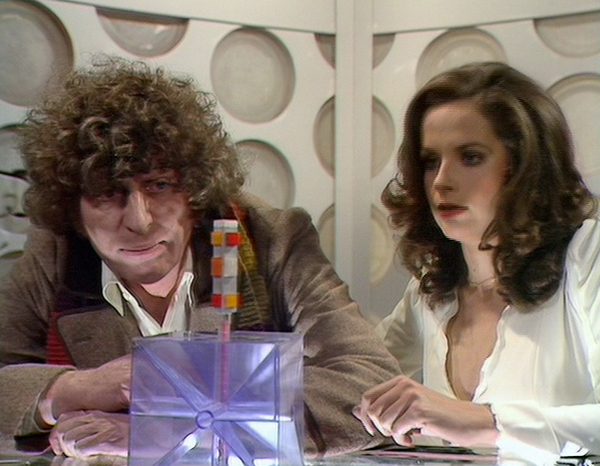 Romana: Right, I'll set the coordinates for Gallifrey, shall I? 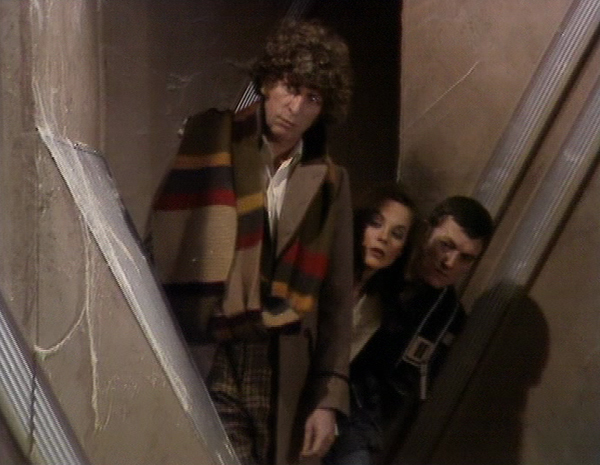 Romana: Well, that's where we're going, isn't it? The Doctor: We have the power to do anything we like. Absolute power over every particle in the universe. Everything that has ever existed or ever will exist. 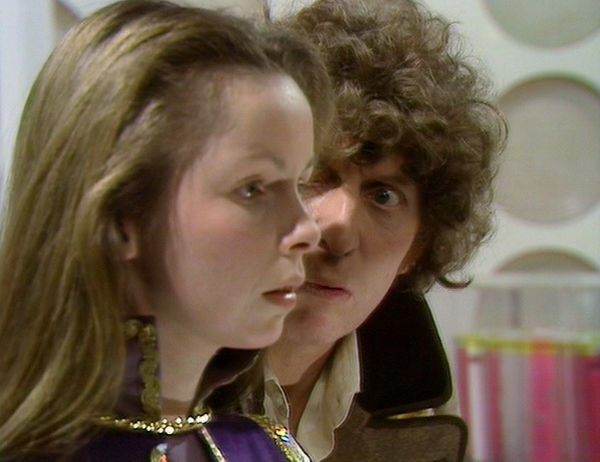 As from this moment… Are you listening to me, Romana? 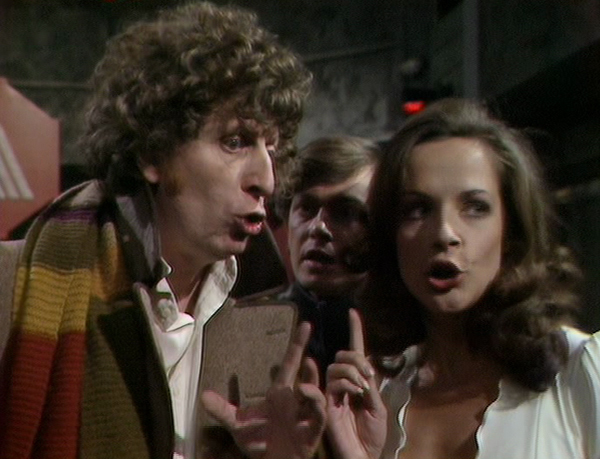 Romana: Yes, of course I'm listening. The Doctor: Because if you're not listening, I can make you listen, because I can do anything. As from this moment, there's no such thing as free will in the entire universe. There's only my will, because I possess the Key to Time! 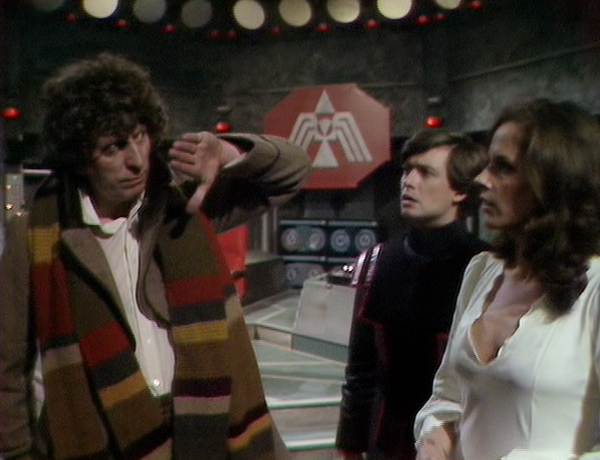 Romana: Doctor, are you all right? The Doctor: (normal) Well of course I'm all right. But supposing I wasn't all right. This thing makes me feel in such a way I'd be very worried if I felt like that about someone else feeling like this about that. Do you understand? The Doctor: What do you understand? I’ll give Baker’s indulgences more slack than most (I'll even give him the Eden scene) but this one doesn't do it for me. What's on paper is fine, but the delivery…. Barnes attempted to defend the scene, but his logic entirely supports the case for the prosecution. 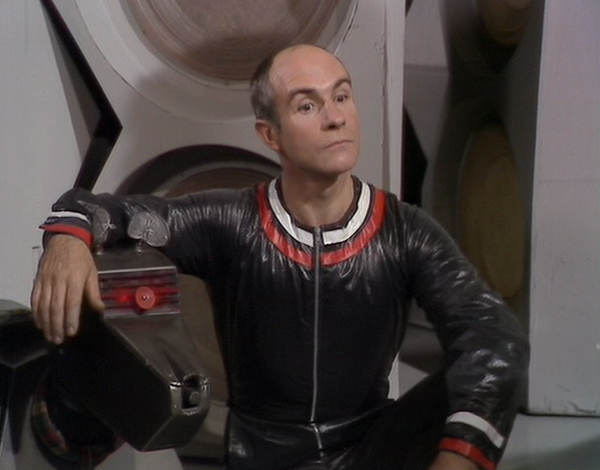 He suggests those who recall the story "miss the point entirely; they say, for example, that the finale – wherein the Doctor refuses to give the assembled Key to the White Guardian, having surmised that he is, in fact, the Black – is somehow disappointing. 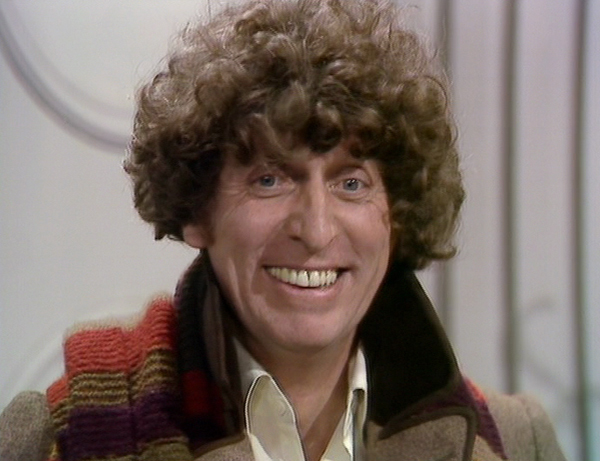 They say that Tom Baker overacts ludicrously when the Doctor's finally got the completed Key in his grasp, and he wonders "What if it wasn’t alright?" – appearing to actually contemplate seizing the power at his command". 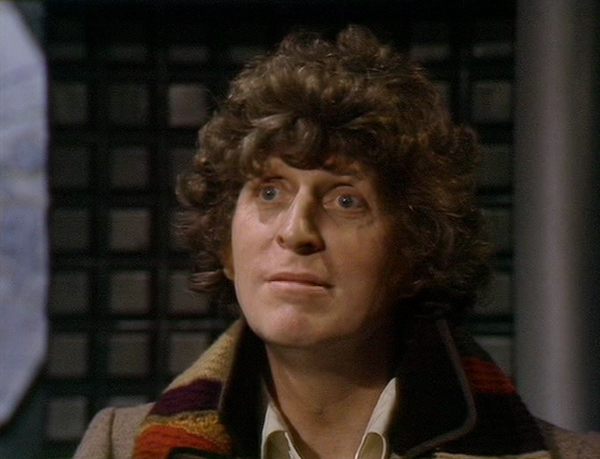 Barnes goes on to invoke the similar internal debate at the end of Genesis of the Daleks: "... if Tom goes all grave and broody, it seems, he's magnificent; if, however, he rolls his eyeballs, he's awful". Well… yes. Pretty much. Awful is pushing it maybe, but this bit of business feels faintly desperate rather than inspired. Not all his improvisations land, and this is one of them. You can usually brush them under the carpet regardless, but he's doing it at a crucial point in the story. Which brings us to that scene itself, and its place in capping an epic, or anti-epic. 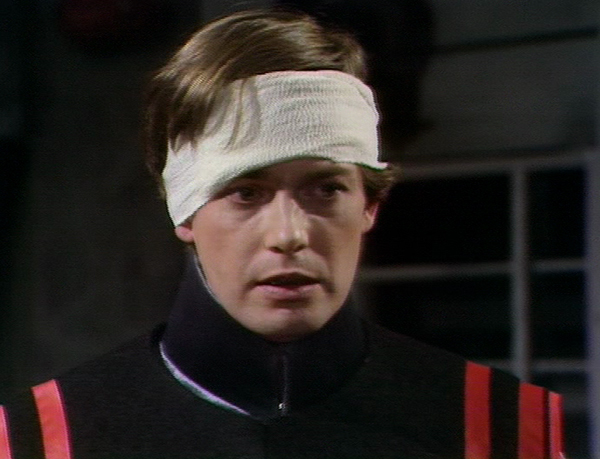 Barnes attests that the interplay between Tom and Valentine Dyall is "very good indeed", and it's certainly good, but I think the point is rather that the scene is climatically dissatisfying, in terms of narrative clarity most of all. As the TV Companion observed, it "ultimately fails to tie up all the loose ends and leaves the over-arching plot strangely unresolved". Sandifer's blind contempt for the Bristol Boys leads to her perversely inverting the quality of the entire story. It simply isn’t true that "The final TARDIS scene is wildly better than anything that comes before it, shot through with the kind of ambiguity and scepticism towards the Key to Time that characterised the early days of the arc". Notably, Baker and Martin left the ending blank for Williams and Adams to resolve it as they would, and Sandifer obtusely interprets their lack of an idea on how to wrap it up as ambiguity, so distorting what’s actually presented (both in the scene and previously in the story) in her desire to fit the content to her broader argument ("there’s the strong sense that the Doctor's shattering of the key is done not just to screw up the Black Guardian's plans but to screw up the entire process"; there’s no such thing, but if one's able to draw that from it, it's illustrative of how lacking in clarity the finale is). To wit, I think Williams and Adams weren't just left a blank, they drew one, fudged it and hoped no one would notice (rather like the fake segment). 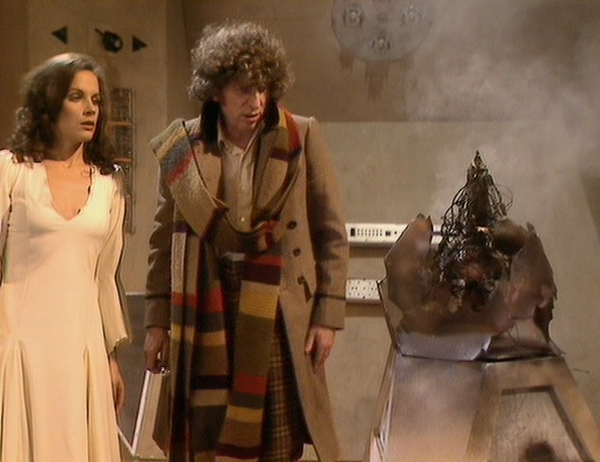 Romana: We're murderers. First Astra and now Merak. 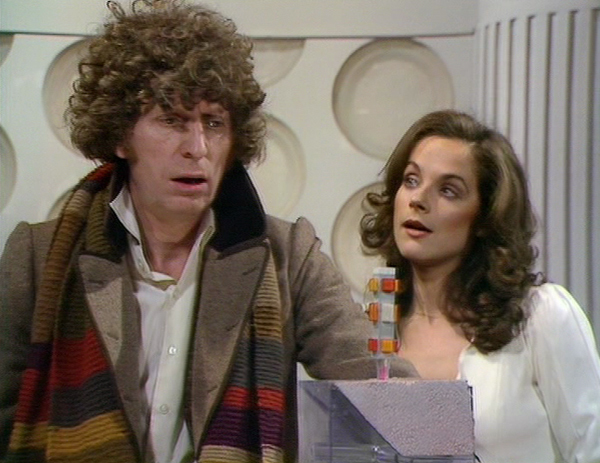 The Doctor: Romana, it wasn't our idea to use the Royal House of Atrios as carriers, was it?Romana: No, but what happened to Astra was our fault. We're just pawns here to do the Guardian’s dirty work. 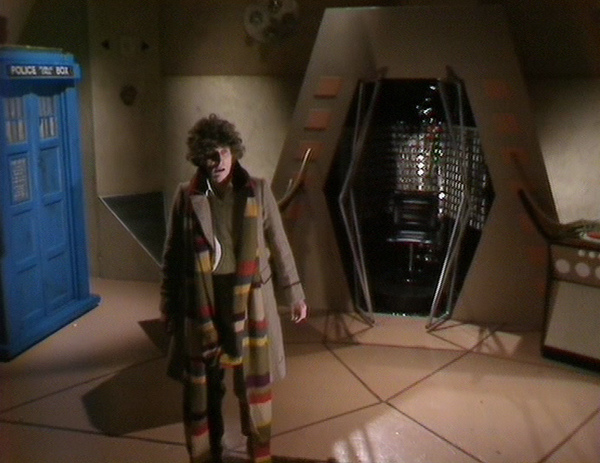 The Doctor: I don't like it any more than you do, but it's done. Have you set those coordinates yet? Romana: Is that all you can say? She was a living being, and now what is she? A component. And Merak thinks she's still alive. No power should have that right, not even the Guardians. We must do something! 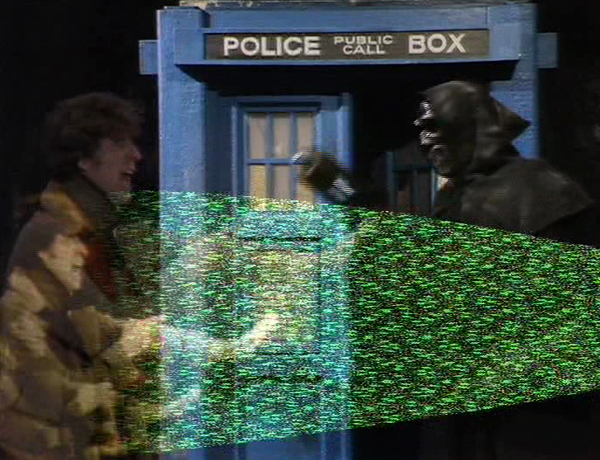 The Doctor: Well, you could start by setting the coordinates for Zeos. 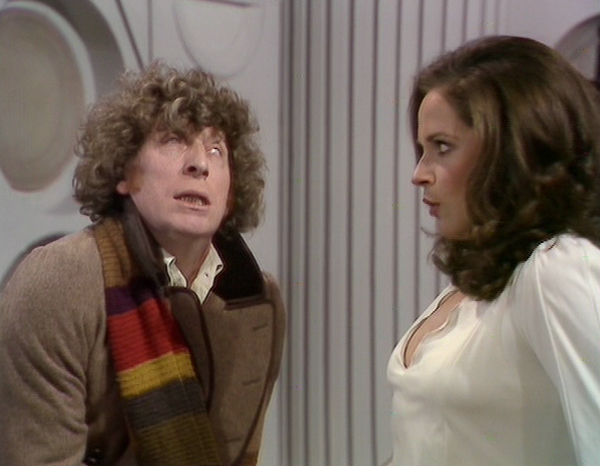 The Doctor: Romana, you get carried away. If you don't set those coordinates, millions of people will die and this time it really will be our fault. Yeah, if only they had an inkling of how to present ambiguity and scepticism towards the Key to Time. I'd also argue that the Doctor's rationalisation is a "quick fix" on the part of Williams and Adams. 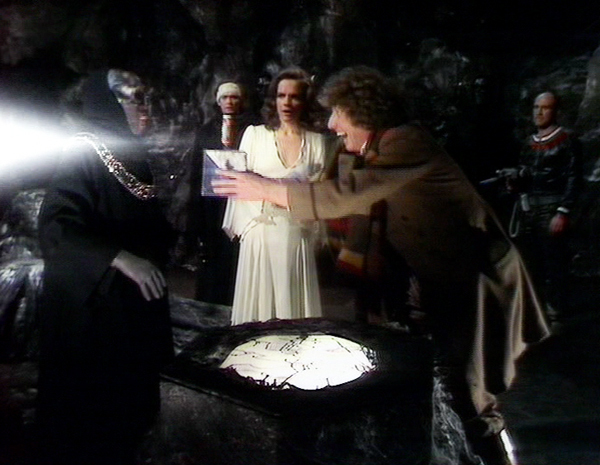 It doesn't really add up, suggesting the White Guardian must perceive morality in the same way as the Doctor, forever being emotionally manipulated by villains into prizing individuals over whole worlds. He would surely have to approach the matter in a more universal, utilitarian sense if he was worth his salt (besides which, there's the argument from Episode One of The Ribos Operation – an interpretation I don't subscribe to – that he's quite willing to threaten the Doctor, so does he really have such a regard for human life?) 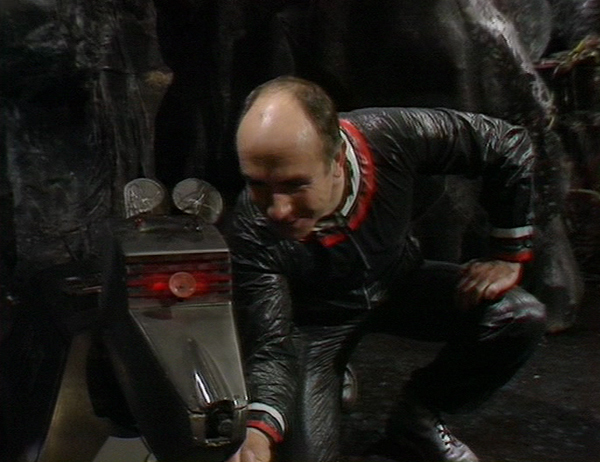 So the Black Guardian's argument that it is regrettable, but the fate of the universe is at stake, seems entirely reasonable. 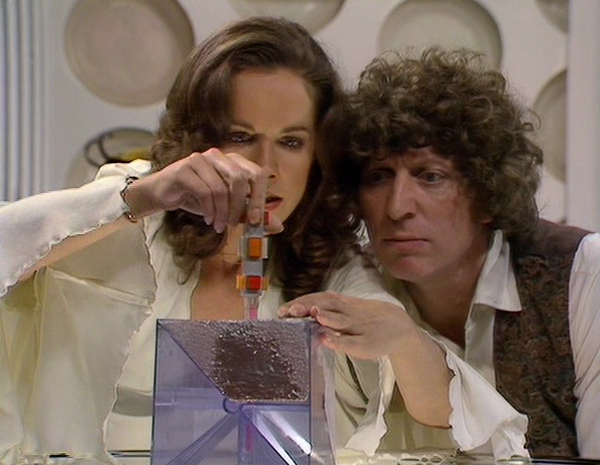 The Doctor and Romana also make assumptions here they can't possibly know: that dispersing the Key will restore its components to their previous forms, for example. The Doctor: What happens now, sir? You said, if I remember in our first conversation, that once it was assembled it would stop the entire universe and enable you to restore the natural balances of good and evil throughout the whole of the universe. The Guardian: That is correct, Doctor. So, will you release the Key to me that I may do this? The Doctor: Certainly, sir, yes, certainly, of course. Key to Time, I command you. Could I ask you something, sir? 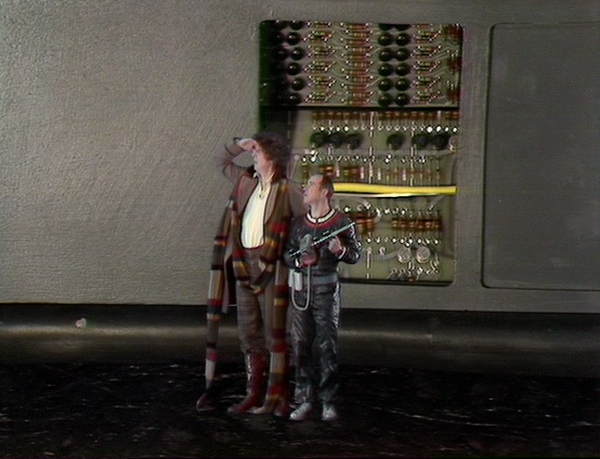 The Doctor: It's just that, well, the Key is already assembled, sir. I mean, couldn't you restore the balances now? The Guardian: Yes, Doctor, but I must have the Key for safe keeping. It is an awesomely powerful key. The other debate regarding the scene is one of whether balance is or isn't restored. 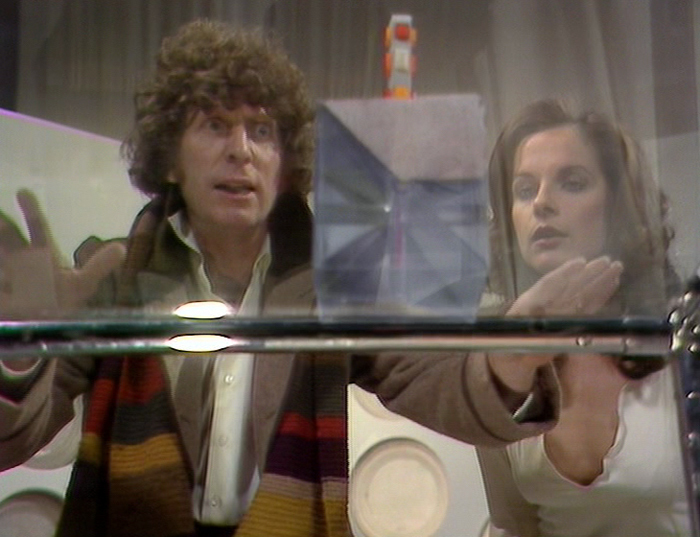 Sandifer thinks the Doctor and Romana "destroy it before anyone can use it". 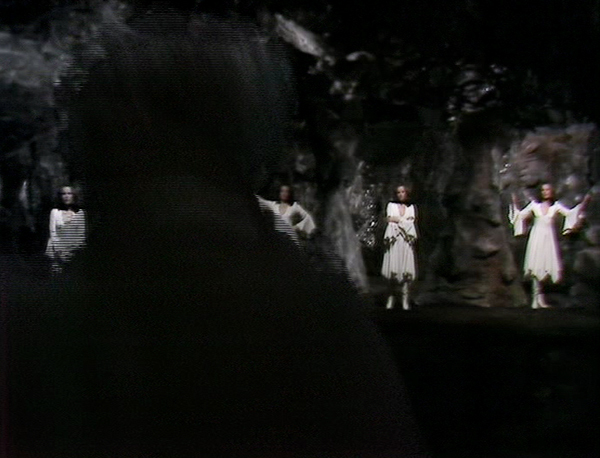 Leaving to one side whether it was indeed the White Guardian who sent the Doctor on his quest, you'd be hard pressed, from the dialogue, to conclude other than that the White Guardian had all he needed to do so without coming into possession of it, as set out above. 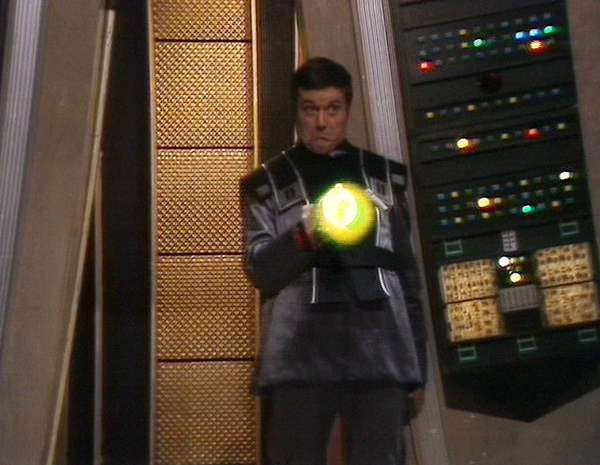 Unless he's being terribly lazy or is unaware that the Key is assembled (which given his powers, seems unlikely). 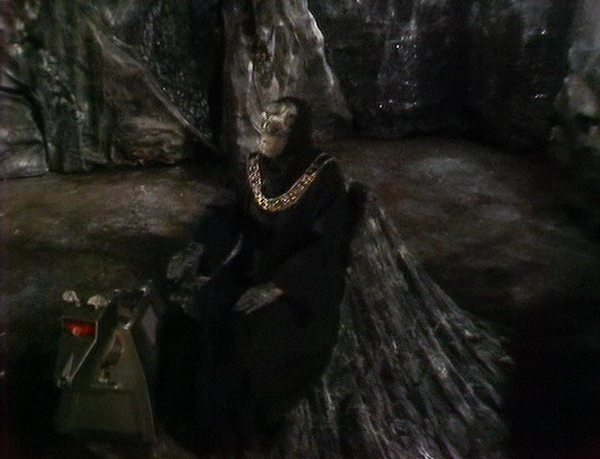 Or unless the Black Guardian is lying, and why would he lie in that direction? It would have been far more sensible for his purposes to claim he did need possession of it to work his magic. The Guardians themselves arguably benefit from a less-is-more quality, since much like Williams' accompanying Key to Time concept, the more you know about them the less they add up. And aside from Dyall's delivery, their personification entirely lacks the epic flavour (anti-epic?) When you have them sitting across from each other at a table with stuffed birds on their heads, it’s difficult to be awed (I like the Guardian Trilogy a lot, but next to no thought has gone into their metaphysical place in things there, particularly when they’re reduced to adjudicating a boat race). Gary Gillatt succinctly summarised their status in the series in his stupidly titled from A to Z collection of essays: "the addition of the Black Guardian as a universal driving force remains an oddly mystical departure for the series". He draws parallels to Zoroastrianism, as has pretty much everyone looking into the genesis of their representation, of competing but balancing dynamics. Under this guiding principal, they are "leaders of benevolent and malign spirits in the eternal battle between good and evil, each fighting to either force the world towards order or chaos". 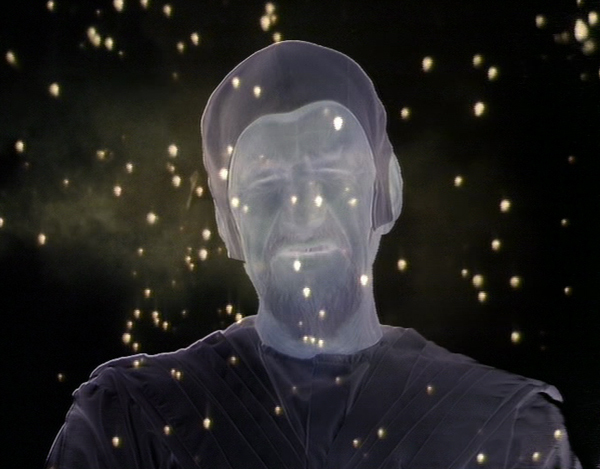 As such, notwithstanding the tendency for, say, the Troughton era to pitch things in polarised fashion, "The Guardians suggest that the universe of Doctor Who is driven by similar forces of essential good and essential evil, and that neither can exist without the other". Just how powerful they are is debatable, though, particularly in terms of tangible influence on the physical universe. Both need agents, it seems, to carry out their whims in this realm (even ones as petty as taking revenge on a single person). Rather than drawing a line, when the show indulges such boundaries it tends to push them back further. 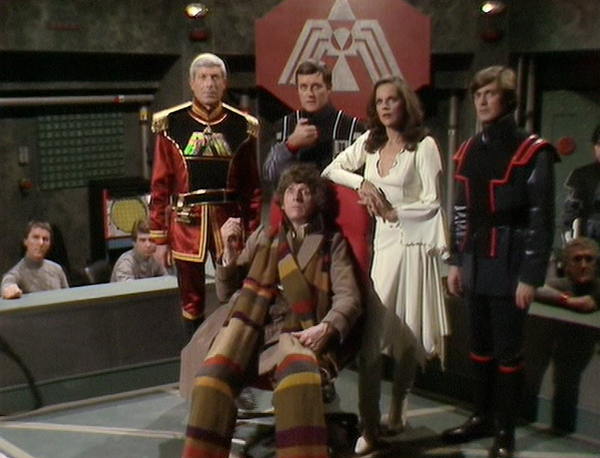 It's been noted how they represent a force as arbiters the all-powerful Time Lords formerly presented, after Williams took the view the latter had been diminished. But they really compare more accurately to the series' more prevalent depiction of deities as aliens, be they Sutekh or Azal. Once the perceived "creators" are unmasked, you're left asking who's really behind the throne. The show has generally gone for a loosely science-based relationship with the universe, such that even stories depicting these most recognisable gods with god-like powers posits a yarn in the middle of the Guardian trilogy explaining the cause of the Big Bang (Terminus), albeit one that's probably less scientifically sound than suggesting a creator dunnit. But with the Guardians, who exist, it seems, to martial the universe rather than instil it, intentionally metaphysical entities who very evidently did not come into being through the forces of evolution (at least, in any classically comprehensible sense), you're left wondering who put them in their place. Zoroastrianism had asha versus druj (order versus chaos), and Ahura Mazda as the ultimate creator of all (except, confusingly, particularly since he is the father of the religion's destructive spirit Ahriman Mainyu, not druj, which is anti-creation). The Guardians thus invited another layer above them from a future producer looking to establish a really impressive highest echelon this time. As presented, their construct is one where "good" cannot triumph but must know its place on the chess board. 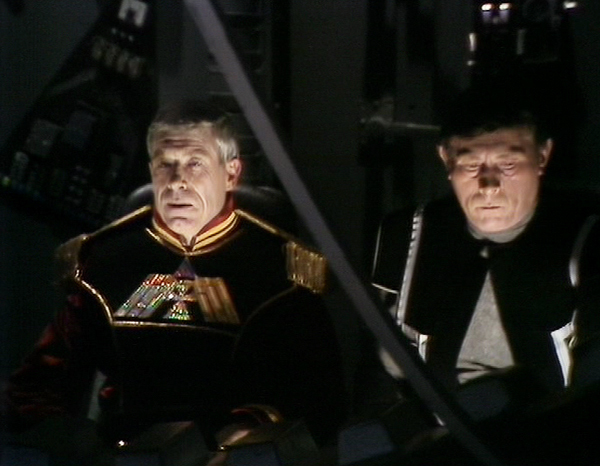 Logically, if the balance of forces became too positive, the Black Guardian would have every right to call in the Master to gather the segments of the Key in order to put things back on an even keel. Drax: Blimey, it's a dog. Who's a little tin dog, then? K9: Your silliness is noted. And Drax. Drax! 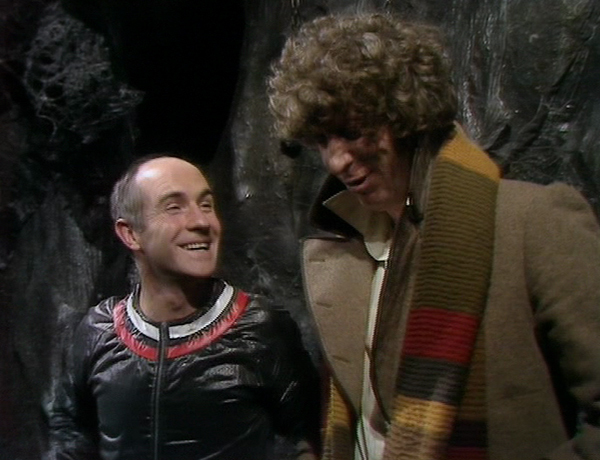 Mike Ashcroft's contemporary review of the story found him wanting, following as it did the line in demystifying and deflating the Doctor's species (somehow, the mere fact of Delgado's Master was never found guilty. Or long before even that, Peter Butterworth's Monk). 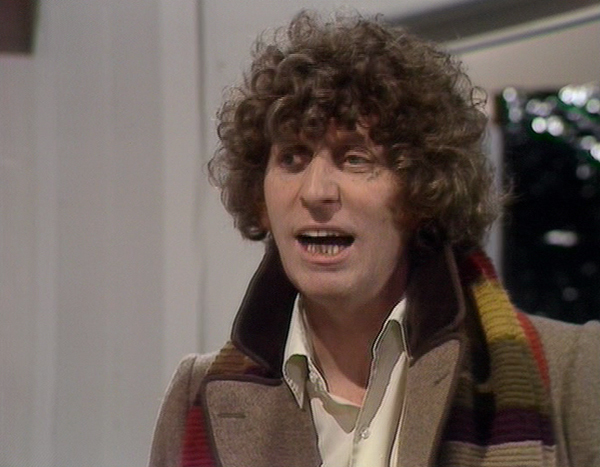 "As a Time Lord, (Drax) did more to ruin the image of Gallifrey than Robert Holmes ever did. His (cockney) accent was taking things a bit far… and the intended humour just wasn’t funny". Indeed, bafflingly, The Discontinuity Guide includes "every other bit of Drax's cockney" in its "dialogue disasters". How can you not love this proto-Del Boy Trotter turns of phrase? The Doctor: Drax, I don't want to pry, but where did you acquire this peculiar vocabulary? 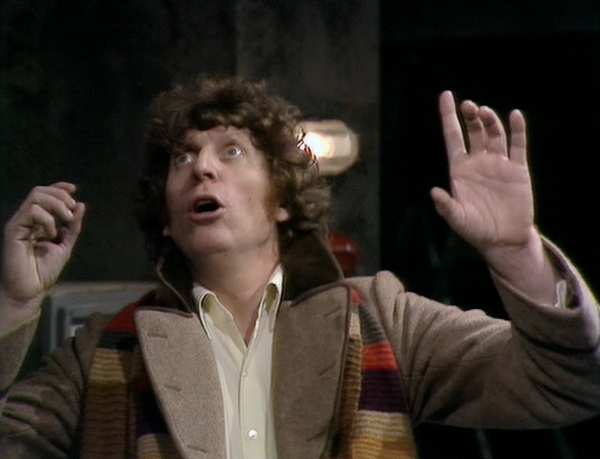 The Doctor: I've been to Earth. Drax: Yeah, me transport broke down. Hyperbolics, as usual. And I was investigating certain possibilities with regard to replacements. I got done, didn't I. Ten years I got. Well, I had to learn the lingo, didn't I, to survive. Why, is there something funny about the way I talk? The Doctor: No, no. It's very colourful. Very demotic. Drax: Yeah, well thanks, Theet. They're probably disgruntled at him calling the Doctor "Theet" too (the debate still goes on as to whether it was intended as his name or a nickname; at least they only introduced it in passing rather than having the gormlessness to make it an entire season arc, and then reveal that his name is "Doctor Who", because, basically, the perpetrator lost the plot as showrunner about a year into the role). Me, I’d have liked to see him in his own spin-off series (What’s that? 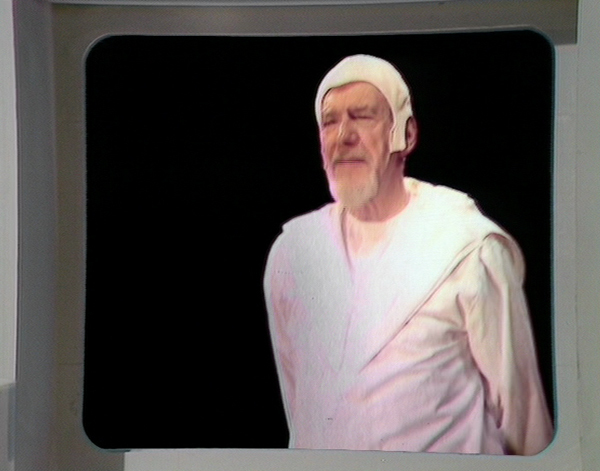 He featured in a Big Finish? Of course, he did. 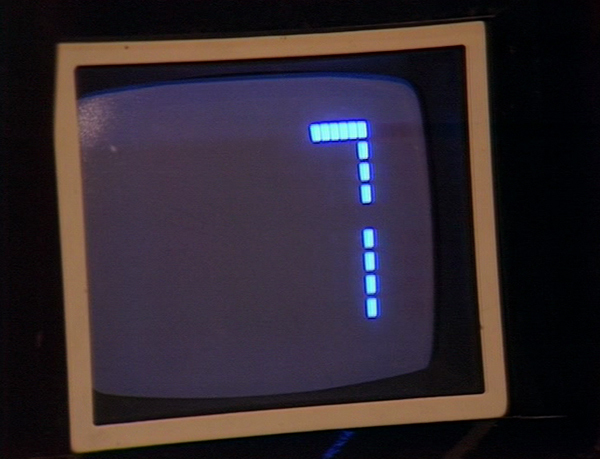 Played by Ray Brooks. This classic – according to the reviews – was directed by Nicholas Briggs. Surprisingly). Marshal: This forcefield. Can you provide it now? Will it give us breathing space? The Doctor: Yes, it'll give you time to save your neck. While I’m an unabashed supporter of The Armageddon Factor, I'll be the first to admit much of it doesn’t bear up to close scrutiny. Even the acclaimed – including among otherwise detractors – idea of jury-rigging the Key seems a bit suspicious, since it suggests fakes could be chemically synthesised, that it's mechanical replicable rather than a "magical" construct. Then there's Mentalis self-destructing, like a scorpion stinging itself with its own tail. Tom makes it sound convincing enough, but I'm not sure it actually makes sense. As for the deflective force shield the Marshal asks for… well, a great deal of Episode Two is devoted to this conundrum, with the Doctor first saying he can't give it (it would require more power than he can put in), then that he'll go fetch a Zeon, and then, when it’s clear he's done nothing at all, there's the above exchange, after which we hear no more about it. 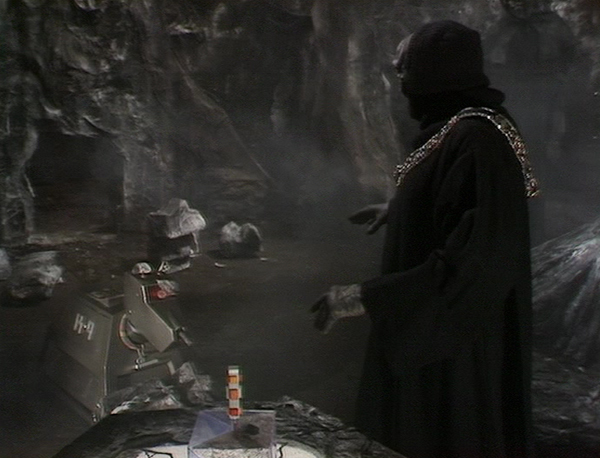 It's more bewildering than the showdown with the Black Guardian, as it just seems like someone's lost their thread. 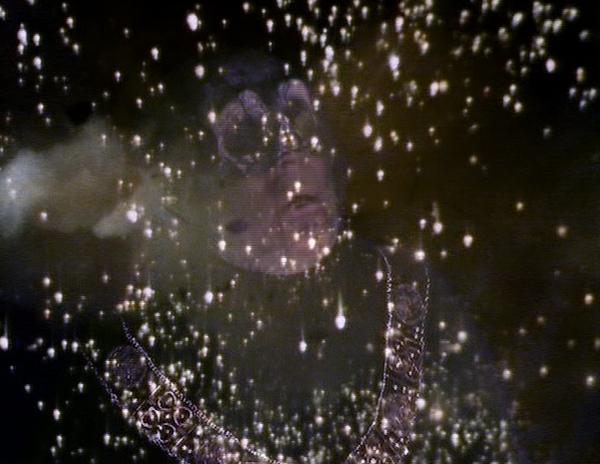 I'm less concerned by the even-less-subtle-than-usual plot recaps that occur intermittently (including Romana being told twice she's actually working for the White Guardian), or K9 spinning again for the first time (The Pirate Planet) or the Shadow letting the Doctor go in Episode Three (hoisted by his own petard seems about right). The Armageddon Factor's one of my favourite Baker and Martin stories (Sandifer would say there's little competition) up there with similarly unloved Nightmare of Eden (and The Invisible Enemy). It has it all: varied settings, eclectic characterisations, an abundance of ideas. 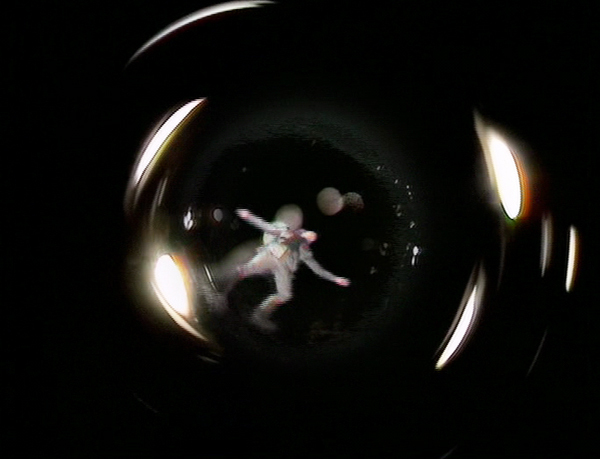 The first is one of the great opening episodes, establishing multiple plot elements and creating compelling mystery. 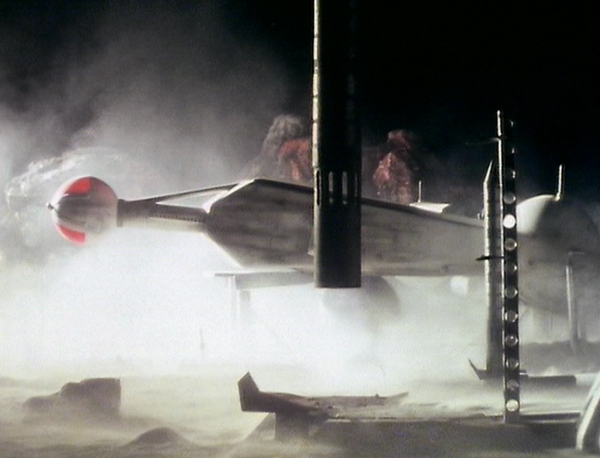 The escalation at its climax is particularly well-oiled, the construction of which is perhaps only eclipsed by the end of The Keeper of Traken Episode Two. And in the story as a whole, there's something to be savoured at each stage, from K9 and Mentalis, to the Marshal’s time loop, to Drax (Drax!) Baker and Martin even give us "slag and clinker" again (see The Mutants). Its stumbling point is resolving the season arc, which is more of a shrug than a decisive gesture. But The Armageddon Factor caps my favourite season with aplomb, so I'll leave the sign off with my favourite character in my favourite season. The Doctor: Can I drop you somewhere, Drax? Drax: No thanks. I've got a contract job on down there. The Doctor: Contract job? No armaments, I hope. Drax: No. Reconstruction, war damage, scrap and that. Me and the Marshal's going fifty-fifty. 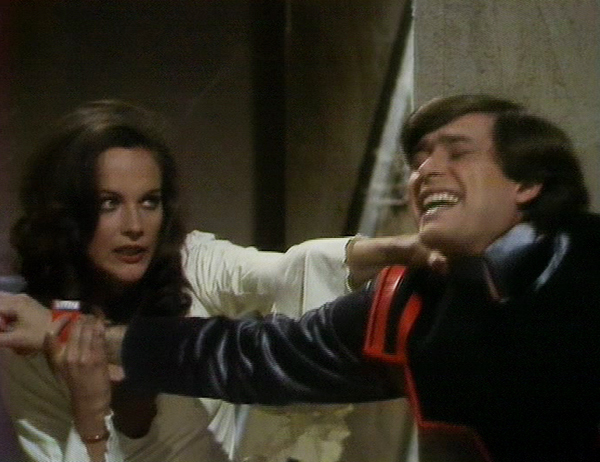 Romana: You and the Marshal? Drax: Yeah, well, he's out of a job now, isn't he? 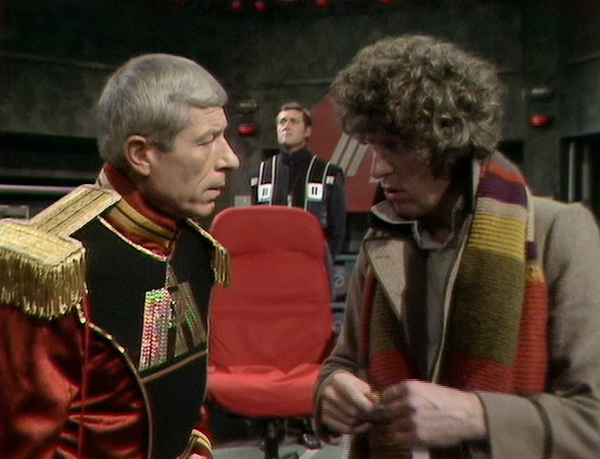 I mean, no war, no job, so I took him on.The Doctor: When did you arrange this? Drax: In about half an hour's time, I should think. The Doctor: I see. Fifty-fifty? Drax: Well, sixty-forty, know what I mean? Drax: (indicating the Key) And if you ever want to get rid of that thing just let me know, won't you. The Doctor: I'll let you know. Bye, bye, Drax. Drax: Right then. Bye all. Drax: Remember me to Gallifree. The Doctor: Bye, bye, Drax.